This a set of 12 unframed reproduction WWII Willys Jeep Military Vehicle Parts patent illustrations Prints, overlaid on lightly distressed chalkboard image as the background, with faint white chalk markings consistent with a well used old chalkboard as part of their charm and character. Chalkboard background prints are currently a very stylish and popular home decor trend. Each image size is 8x10", printed on 8.5x11" size archival quality premium matte medium weight (56 lbs.) photographic paper. Prints Only, Does Not include any frames or mats. Recommended frame sizes to use: 11x14" frames with 8x10" mats. If you wish to use 8x10" frames, you will need to cut the paper down to 8x10" in order to fit. When framed and displayed together would make a remarkable Jeep themed wall gallery. 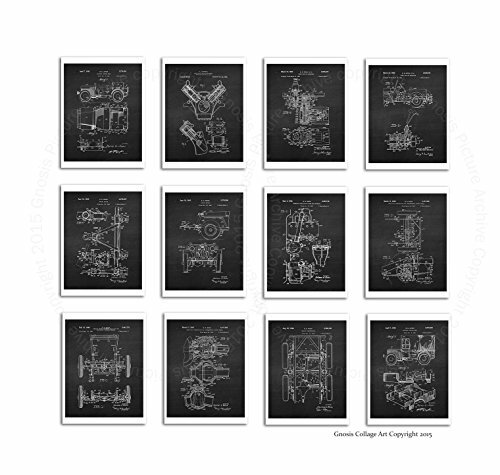 This set of 12 prints include #1 1942 Military vehicle body; #2 1922 Baffle plate for V-type motors; #3 1953 Power take-off mechanism; #4 1953 Power take-off mechanism; #5 1945 Towing device; #6 1945 Towing device; #7 1946 Crankcase ventilation system and apparatus; #8 1947 Drive axle construction; #9 1949 Vehicle spring suspended half-axle for supporting steerable wheels; Print #10 1947 Drive axle construction; #11 1944 Vehicle construction; #12 1942 Military vehicle body.